Posted on October 31, 2015 by Appropos / This entry was posted in Informative, New Products, Product Reviews. Bookmark the permalink. The folks over at PAX Labs must seriously know what they’re doing. Following the release of it’s newly debuted Pax 2 model, PAX Labs has released their own rendition of the electronic cigarette. Introducing, Juul. 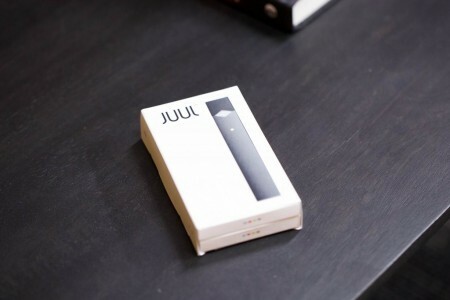 The Juul is a sleek, elegant, rectangular e-cigarette that promises more of the nicotine kick comparable to a regular, combustible, tobacco cigarette. 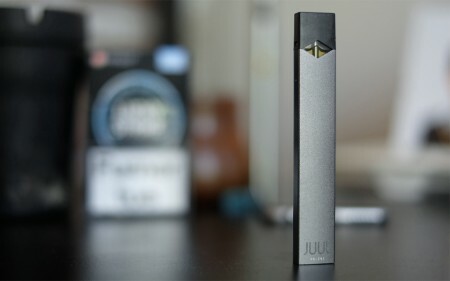 The Juul measures about 3.5 inches in length. Its angular design is modern, and the brushed aluminum finish speaks volumes of quality and craftsmanship. The first thing you’ll notice upon taking it in your hand is just how exceptionally light it is. The construct behind the device feels solid without heft. The device bears close resemblance to your typical office USB thumb drive. A small light atop the battery serves as a status indicator for the device—green indicating ready for use, white indicating “in use” or charging, and red indicating a low battery. A simple double-tap of the light, will show the battery’s status. Juulpod’s are several small color-coded, flavored, refillable nicotine cartidges, including Tabaac (Tobacco), Miint (Menthol), Fruut (Berry), and Bruule (Vanilla). These small jewel embossed cartridges are just as sleek and stylish as the battery of the device. 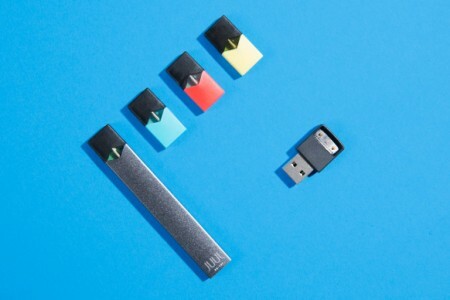 They’re transparent in appearance allowing a visual of the Juul E-Liquid. 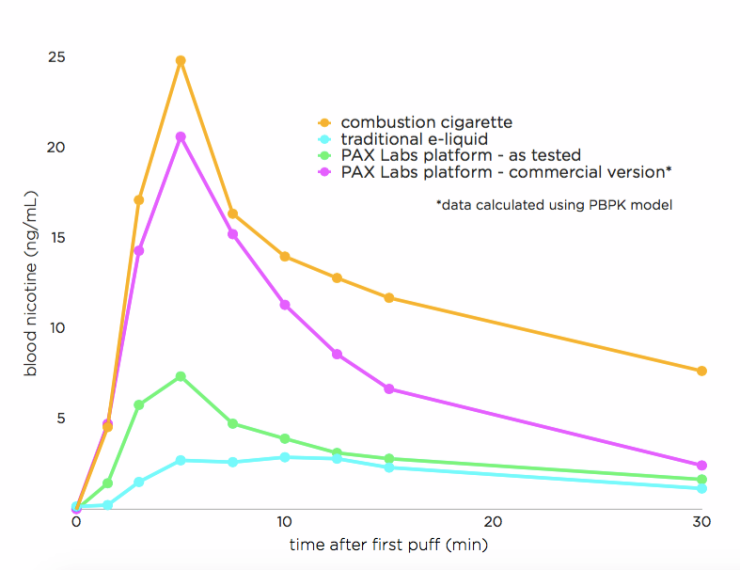 The idea behind Pax’s perfected chemistry is that The Juul’s function will peak the nicotine content in your blood five minutes or so after your first inhale, closer to what you’d get with a combustible cigarette, hoping this feature will make more smokers hip to it. There are no buttons to press; to draw you simply pull and a sensor will fire up the coil and vaporize the liquid. Internal temperature controls ensure a consistent puff. One pod is the equivalent of a pack of cigarettes. 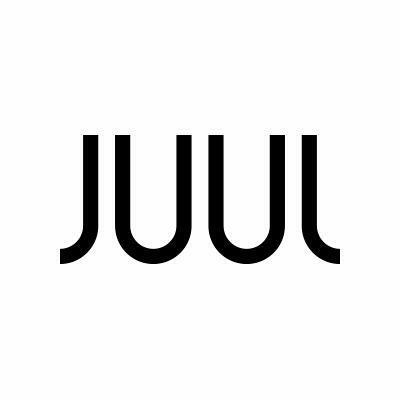 The science behind how Juul delivers nicotine to your bloodstream is a driving force behind it’s marketing. When compared to traditional e-liquids, the company uses “nicotine salts found in leaf-based tobacco as the core ingredient. By extracting and using those salts, Pax is able to create an experience that is more like smoking than other e-cigarettes on the market. That includes offering up to two times the nicotine strength and three times the vapor quality of competing products.” Plainly put, when you draw from the Juul, the feeling you get is much like that of a real cigarette. Nicotine levels spike quickly & descend slowly, whereas traditional e-cigs slowly build up and don’t give you the lightheadedness and alertness that smokers crave. The company even commissioned a study on this. Please refer to the data below. In the vein of longevity, the Juul’s careful way of vaporizing it’s nicotine is it’s real draw. 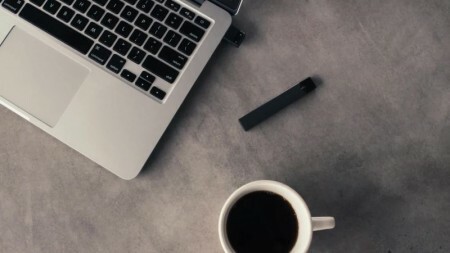 The temperature of the Juul’s heating element is controlled to give you the largest possible cloud of vapor, without any of the dangerous compounds that can come with overheating a coil. Such temperature control is unheard of in disposable cartridge style e-cigarettes, so we can thank the guys at Pax for their innovation. The Juul’s sleek, minimal, design is one synonymous with Pax Labs. Much like their herbal vaporizers, the Juul highlight’s simplicity and user-friendliness. Juul is definitely not for the keep vaping weird crowd, who seem to lean on customization features. It is a creature of simple and intuitive design.